Developing or implementing a system to collect, manage, report and evaluate patient safety data can be time consuming and expensive. Companies of all sizes need a system that is compliant with global regulations, easy to access and use, fast to implement, and simple to maintain. The system must be affordable, allowing companies of all sizes to deploy a high-quality solution that is cost effective for managing their current caseloads, while also capable of growing with their business. An ideal system would be flexible, could integrate with other databases, and is designed to manage not only adverse events from clinical trials and those occurring spontaneously in the field but could also manage medical inquiries and product quality complaints for all medical products, including traditional pharmaceuticals, biomedical products and medical devices. PV-Works (human) is a flexible software system designed to support pharmacovigilance business processes and technical services case handling practices, while meeting the associated company safety and world-wide regulatory reporting requirements. The pharmacovigilance database has been designed around the ICH E2B guideline such that every E2B data field maps to a specific database field. Coding to MedDRA is simple. In addition to paper reporting outputs such as CIOMS and MedWatch 3500s, an electronic reporting function is included. Aggregate listing outputs like PSUR, DSUR, and PBRER are simple to generate using built-in tools. In addition to simple yet comprehensive data entry and reporting functions, the fully integrated workflow functionality will ensure SOP compliance and that critical reporting deadlines are met. Regulatory compliance is afforded with the adherence to key requirements such as FDA 21 CFR Part 11 and the provision of a full audit trail. PV-Works is a process driven system. 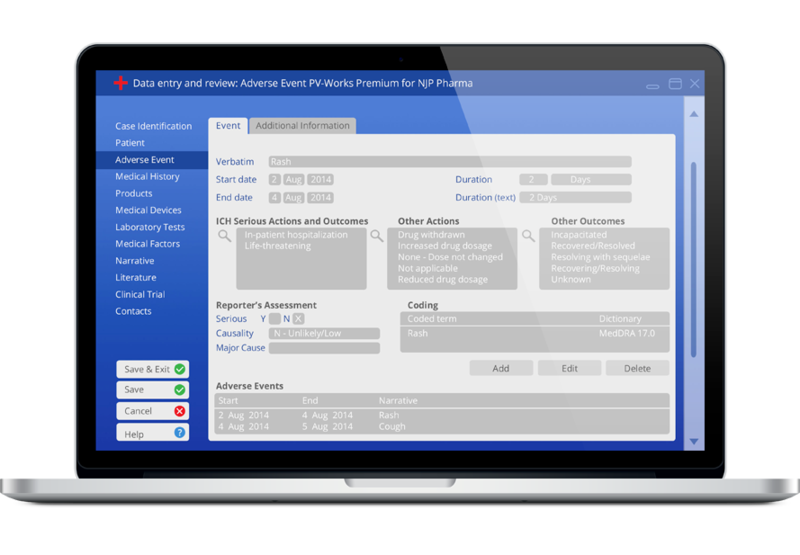 A purpose-built workflow engine is integrated with comprehensive safety functionality in order to provide management control of pharmacovigilance processes. The software also includes a wide range of powerful querying functionality, allowing business teams to monitor case handling, track compliance, and execute in-depth trend analysis. PV-Works submits electronic adverse event reports in full compliance with the ICH E2B standard (both R2 and R3 formats are supported). Furthermore, electronic medical device adverse event reports may be submitted to FDA CDRH in eMDR format. The systems is easily integrated with standard AS2 gateway software to manage electronic submissions. Acknowledgement messages and batch submissions are comprehensively handled. The import of E2B compliant XML formats is also fully supported, allowing receipt of cases submitted to industry directly from Competent Authorities and partners.